Vet to Vet Tennessee and the University of Tennessee College of Law will host a free expungement clinic in Madisonville on April 21 and are seeking attorney volunteers to help out. The clinic will take place from 9 a.m. to noon at the First Baptist Church of Madisonville and aims to help residents in Bradley, McMinn, Monroe and Polk counties. To sign up to volunteer or ask a question, contact Troy Weston. Fifty years after Dr. Martin Luther King Jr. was tragically killed in Memphis, events in commemoration are going on all day and all week in Memphis. Follow events on The Commercial Appeal’s live blog. TBA President Lucian Pera tweeted a call for all Tennessee lawyers to pause at 6:01 p.m., the time Dr. King was shot. Pera's challenge asked attorneys to respond to @TennessseeBar with "one thing you can personally do to help the cause of justice." The Legal Aid Society of Middle Tennessee and the Cumberlands has named attorney DarKenya W. Waller as its new executive director. Waller, who previously served as managing attorney of the firm’s Nashville office, replaces Gary Housepian, who served as executive director for the last decade. Waller joined Legal Aid Society in 2008 as a staff attorney and was named managing attorney of the Nashville office in 2010. “We conducted a nationwide search for the right person to replace Gary, and in the end, discovered that the best candidate was already with us," said Bob Martineau, president of Legal Aid Society’s Board of Directors. "We’re excited for Legal Aid Society to continue its mission of providing free legal assistance to low-income individuals in our community under DarKenya’s leadership." The Tennessee Justice Center has announced a new event honoring mothers and fathers who advocate on behalf of the rights of children, especially those with special needs. The TJC will host its first annual Mother’s Day Luncheon on May 1 from 11:30 a.m. to 1 p.m. at the Renaissance Hotel in Nashville. Single tickets are $125 and tables are $1,000. To RSVP or for more information, visit the TJC website. The proposed FY 2018 omnibus appropriations legislation includes $410 million in funding for the Legal Services Corporation (LSC), an increase of $25 million over the past two fiscal years and the highest appropriation since 2010. LSC provides the central foundation for the civil legal aid and pro bono system in the U.S. The funding increase in the omnibus legislation comes after President Trump’s earlier proposal to eliminate the LSC was abandoned following bipartisan outcry from business and politicians. American Bar Association president Hilarie Bass sent a letter to U.S. Attorney General Jeff Sessions asking the Department of Justice to keep the doors open at the Office for Access to Justice. “We urge you to make reorganization decisions that assign responsibility and provide adequate funding for the critical programs that preserve access to justice for all Americans – both rich and poor – and demonstrate the Department’s unwavering commitment to this core value and the rule of law,” Bass wrote. Tennessee lawyers gathered at the Corporate Counsel Pro Bono Initiative Gala Saturday in Nashville. Over the past 12 years, the event has raised more than half a million dollars in support of pro bono efforts that engage in-house and corporate counsel with legal aid programs across the state. The program featured remarks from past TBA President Buck Lewis and Ann Pruitt, executive director of the Tennessee Alliance for Legal Services, as well as TBA Executive Director Joycelyn Stevenson and leaders from the TBA Access to Justice Committee. This year’s event was hosted by Bass, Berry & Sims and honored outstanding law firm and legal departments. This year, Eastman Chemical Company and Bass, Berry & Sims were honored for their pro bono efforts. See photos from the event or learn more about the Corporate Counsel Pro Bono Initiative. The Legal Aid Society of Middle Tennessee and the Cumberlands will host a luncheon to kickoff its annual Campaign for Equal Justice, chaired by Scott Hickman of Sherrard Roe Voigt and Harbison. The event will feature keynote speaker William C. Koch Jr., dean of the Nashville School of Law. The campaign, now in its 31st year, has a fundraising goal of $826,000 for 2018. The luncheon will be held on March 7 from 11:45 a.m. to 1:15 p.m. at the Nashville City Club, 201 4th Ave N in Nashville. Those who wish to attend should RSVP to Jonathan Houghton by Monday, March 5. The Community Legal Center (CLC) in Memphis will host a bar trivia night in support of its organization March 28. Called “Quiz for a Cause,” the event will be held at Ghost River Brewing Co. from 7 to 9 p.m. The cost is $5 per person. All proceeds will benefit the CLC. The TBA's Young Lawyers Division is seeking volunteers for a Wills for Heroes Clinic scheduled for March 3 in Lewisburg. The clinic, which will provide wills and other end-of-life documents to first responders, will be held from 8:30 a.m. to 1 p.m. at the Law Office of David McKenzie, 205 West Commerce Street. Volunteers should contact Debbie Zimmerle Boudreaux at (931) 359-7305 or debbie@davidmckenzielaw.com if interested. Tiffany M. Graves will serve as Bradley’s pro bono counsel, overseeing the development and administration of the law firm’s pro bono programs. Graves will be the first person to serve in this newly created firm-wide position designed to develop and grow outreach to the communities across the states in which the firm operates. Graves is based in the firm’s Jackson, Mississippi, office and most recently served as the head of the Mississippi Access to Justice Commission. The Putnam County Commission yesterday approved a request from General Sessions Court judges to appoint Candie Cooper, a youth services officer in the juvenile court system, as a judicial commissioner and have her serve at the Upper Cumberland Family Justice Center, the Herald-Citizen reports. It will simply the process for victims of domestic violence to obtain orders of protection. The Family Justice Center provides services to victims of domestic violence, sexual assault and elder abuse. The TBA Access to Justice Committee, in partnership with the TBA Corporate Counsel Section and the Association of Corporate Counsel, is hosting the 12th annual Corporate Counsel Pro Bono Initiative Gala on March 3 in Nashville. The gala, which will be held at the Pinnacle at Symphony Place, will feature remarks from Eve Runyon, president and CEO of the Pro Bono Institute, and the CCPBI awards presentation. Attorneys from Eastman Chemical Company in Kingsport will be honored as outstanding legal department for their work with Legal Aid of East Tennessee and Bass, Berry & Sims will receive the law firm award for its ongoing work supporting the Tennessee Justice Center. The deadline to become an event sponsor or purchase tickets is Friday. Contact Liz Todaro, TBA Access to Justice Director, for more information. The TBA's Young Lawyers Division is seeking volunteers for a Wills for Heroes Clinic scheduled for March 10 in Dyersburg. The clinic, which aims to provide wills and other end-of-life documents to first responders, will be held from 9 a.m. to 1 p.m. at the McIver’s Grant Public Library, 410 W. Court St. Volunteers should contact Megan Warden, (901) 821-0044 if interested. American Bar Association President Hilarie Bass released a statement today in response to proposed cuts to the Legal Services Corporation. “In the face of strong bipartisan agreement over the value of LSC’s important work, the administration’s second budget proposal to defund such services is unwarranted and should be dead on arrival.” Bass said “Studies show that every federal dollar spent on legal aid returns to communities more than three times as much in benefits such as social services.” Law.com reports that President Donald Trump's proposed 2019 budget would eliminate the Legal Services Corp., a move that the administration attempted in last year's budget proposal but abandoned after outcry from businesses and politicians. Volunteers are needed for an expungement clinic in Memphis Saturday at St. Andrew AME Community Life Center and Gymnasium, 1472 Mississippi Blvd. Those interested should let Amber Floyd or Brittany Williams know their availability. Training will be provided at 9 a.m., while the clinic starts at 10 a.m. The clinic is sponsored by the TBA's Young Lawyers Division, the Memphis Bar Association, the Ben F. Jones Chapter of the National Bar Association, the Tennessee Faith & Justice Alliance and the Shelby County General Sessions Clerk’s Office. The Fred D. Gray Institute for Law, Justice & Society will host another legal advice clinic on Feb. 20 at the St. James Missionary Baptist Church, 600 28th Avenue North in Nashville. Attorney volunteers are needed to assist from 5:30 to 8 p.m. It will be an advice-only clinic with no expectation to take on continuing representation. Contact Randy Spivey for more information. The U.S. Department of Justice has shuttered the Office for Access to Justice, which began in 2010 with the goal of making legal aid accessible to all citizens, The New York Times reports. While Attorney General Jeff Sessions cannot close the office without notifying Congress, he can effectively close it by reallocating its resources. The offices are now dark and no longer staffed. The DOJ has not commented on the move. The Tennessee Supreme Court’s Access to Justice Commission is seeking input from the legal community to help in planning efforts as it develops a new strategic plan in March. A brief survey is available for all who wish to share thoughts and feedback. The survey will remain open through Feb. 7. Please contact Anne-Louise Wirthlin at the Administrative Office of the Courts with questions or for more information. Legal Aid of East Tennessee and the East Tennessee Children’s Hospital have partnered to create the Children’s Health Law Partnership (CHLP), the first program of its kind in the Knoxville area. The new program places a civil legal aid attorney on the care team with the doctors, nurses and social workers at the hospital. The attorney works to address non-medical issues that impact positive medical outcomes. The Children’s Health Law Partnership is funded through a 2017 grant from Trinity Health Foundation of East Tennessee. For more information on this program, contact the Knoxville office of Legal Aid at (865) 637-0484. Tennessee's Access to Justice community was in the spotlight this past week when the Board of the Legal Services Corporation held three days of meetings and events in Nashville. Former Tennessee Supreme Court Justices Janice Holder and William Koch, Chief Justice Jeffrey Bivins and former TBA Presidents Marcy Eason and Buck Lewis were among those addressing the participants. TBA President-elect also Jason Pannu took part in the pro bono awards program, where the Waller firm and volunteers from across the state were recognized for their work. The American Bar Association House of Delegates will consider about three dozen resolutions at the ABA Midyear Meeting in Vancouver, B.C., including recommendations to expand access to the courts, limit use of mandatory sentences, encourage more attention to lawyer health and well-being, and improve civil rights protections for Americans, particularly on the basis of sexual orientation and gender identity. The 601-member House will meet Feb. 5 at 8:30 a.m. to conclude the Midyear Meeting, which begins Jan. 31. Legal Aid Society of Middle Tennessee and the Cumberlands announced that Scott Hickman will serve as the 2018 chair of the Campaign for Equal Justice, an annual initiative that raises funds for Legal Aid Society. Hickman, an attorney at Sherrard Roe Voigt & Harbison practicing in the areas of employment law and business dispute resolution, has been an active participant in Legal Aid’s free legal help clinics since 2000. The Campaign for Equal Justice, set to launch in March, has been held annually since 1987. This year’s goal has yet to be set, but in 2017, the campaign received $814,240 of a $826,000 goal. Three lawyers have been named the Tennessee Supreme Court Access to Justice Commission, and Gail Ashworth has been appointed the new chair. Michael L. Forrester of Kingsport, John L. Farringer of Nashville, and Alexander McVeagh of Chattanooga were appointed to three-year terms to replace the outgoing Marcia M. Eason, David R. Esquivel and Anthony Alan Seaton. Ashworth’s term as chair will last two years, beginning on April 1. 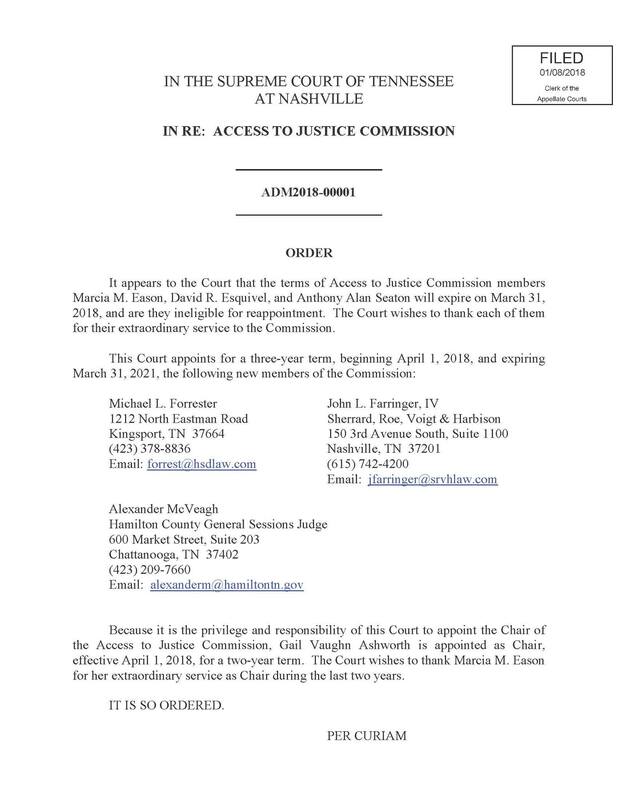 Farringer also currently serves as chair of the Tennessee Bar Association’s Access to Justice committee.